Yelm officially visited the new Yelm High School Tuesday evening, inspecting the sixteen neat compact rooms which compose the building. 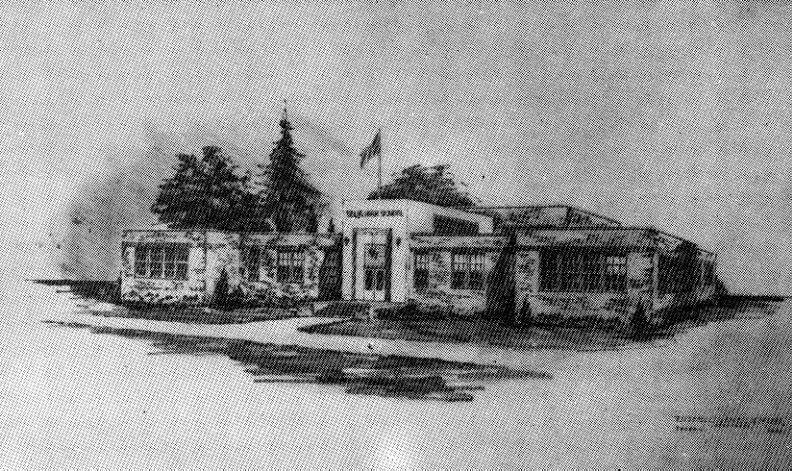 Visitors were welcomed to the class rooms before and after the dedication ceremonies, which took place in the upstairs assembly room. Superintendent O. L. Montgomery acted as a mast of ceremonies and introduced past and present school directors, the architect, John Rogers, the carpenter ??? and many of the members of the state department of education who were present. Marvin Stevens, county superintendent of schools spoke on the higher education of the men in the Army today, whereas only 4 percent of the boy in 1918 Army were high school graduates. Today 41 percent are high school graduates. The standard is still rising and must be kept in progress. 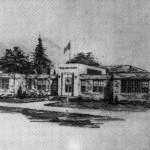 Elmer L. Breckner, state director of reorganization, and a former superintendent or schools in Olympia, talked informally of the progress of school buildings and the equipment, and the response that encourages the youth of today. Mrs. Pearl A. Wanamaker, state superintendent of public instruction, spoke of the need of constantly improving the training of men and women of today and the future. Skill men and women must be trained to replace the semi-skilled. This future need is a constant challenge to the youth of today. She declared we must furnish the means and not let them down. 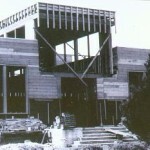 The most unique feature of the building is the fact that the center block of structure is divided into two stories, the upper one being set half a story above the first floor, and the lower one half a story below the first floor. 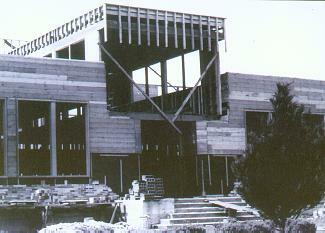 On the upper level is the assembly room which accommodates two hundred students, with room for more seats. Behind the platform hidden away in the best secret-room style, is he press room where aspiring journalists [unclear] body may mimeograph their school newspaper. To one side of the assembly room may be found the glass walled library with one side of this room completely composed of bookshelves containing row upon row of reading material. The basement level of this same section contains the cafeteria with a seating capacity of sixty-nine pupils and the Home Economics Department which consists of a foods laboratory, a sewing and fitting laboratory, and a laundry. The foods laboratory is made up of six unit kitchens, each of which four girls may work at once. The space occupied by the Home Economics Departments of utmost importance in a convenient working arrangement, for one of the classes consists of thirty girls. The main floor is dominated by the classrooms in which are taught in addition to the familiar three R’s clerical work, foreign languages, and chemistry. The latter department is divided into two rooms, one for lecture purposes and the other for laboratory demonstrations. Large windows along one wall of the laboratory carry the pungent fumes from the student’s experiments to the outside of the building, and backers, retorts and Bunsen burners are all carefully stored in the cabinets beneath the long desks with their rows of [unclear]. In the halls are many glass cases for display purposes. In the trophy case in the center hall are eight trophies of Yelm High School’s athletic prowess as well as additional glass shelves for future trophies. Mr. Montgomery’s office is [unclear] across the hall from this case and no doubt he derives much pleasure from looking upon the shining cases, and the smooth linoleum floors which Frank Noble keeps gleaming for the [unclear] students of Yelm High School.